Maria Trolle is the creator of the wonderful images in the Blomstermandala series of books: a graphic designer, gardener, mother and all round amazing lady, she lives in a stunning location that influences all aspects of her life. Her publisher Pagina is based in Sweden, but she has deservedly garnered many fans from around the world. 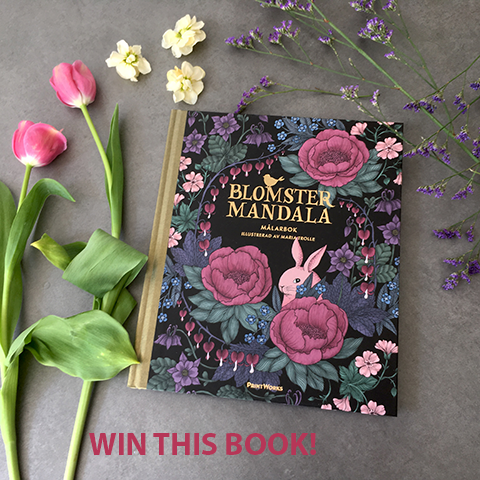 Read on to find out more about her life and inspiration - and discover how you can win yourself a copy of the beautiful Blomstermandala Målarbok. Your work is stunning, for those who might not have heard of you can you tell us a bit more about your career to date? An interview with leading UK based colouring book reviewer Lucy Fyles, who has used colouring as a method to deal with her anxiety. An exclusive interview with Camberwell College of Arts graduate and colouring book artist Lulu Mayo, author of A Million Cats. Includes a sneak peek at her brand new book A Million Dogs! An interview with Suzie Scott: Amelia’s Colourful Colouring Companion featured artist. Surface designer Suzie Scott contributes a richly detailed double page spread inspired by Henri Rousseau's jungle scenes. Austrian illustrator Nanna Prieler draws the Creative Life for my colouring book, and here explains her philosophy of doing everything with love and passion. An interview with Antonia Parker: Amelia’s Colourful Colouring Companion featured artist. Kent based artist Antonia Parker creates exciting work in a variety of mediums, including gouache and ceramics. As a new mother she's also exploring the balance between motherhood and creativity. It's 2015 and the shops are awash with colouring books for adults. But which one should you choose? I cut through the dross and present you with a selection of 8 very different but wonderful books. Plus announcing a special Colouring Print Sets in collaboration with East End Prints. Read on for more updates and colouring examples by featured artists in the book. I love the bold colours and vibrant subject matter of Ana Jaks, a recent graduate of Falmouth University. Her artwork for my colouring book was inspired by her summer holidays. Dagdrömmar is an absolutely stunning colouring book from the pen of Swedish artist Hanna Karlzon. Currently published only in Scandinavia, let's hope it finds a way onto our shores soon. Want to learn more about the adult colouring phenomenon? Then this interview with entrepreneurial colouring book artist Mary J. Winters-Meyer is a must read - a fascinating insight into the rapid growth of this creative hobby. 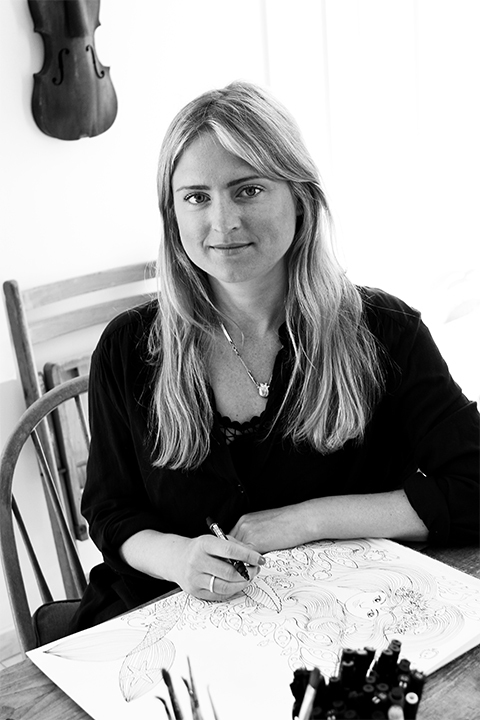 An interview with Harriet Plaskitt: Amelia’s Colourful Colouring Companion featured artist. Harriet Plaskitt was inspired by personal experience to create an intricate double page for my colouring book featuring food. An interview with Nanae Kawahara: Amelia’s Colourful Colouring Companion featured artist. Meet Nanae Kawahara, she's a Japanese illustrator who creates fantastical scenes influenced by a love of Kawaii and the Gothic. Announcing the launch of my unique collaborative colouring book for adults featuring 40 artists. A perfect Christmas gift! An interview with Lydia Coventry: Amelia’s Colourful Colouring Companion featured artist. Plymouth University graduate Lydia Coventry has created a bird lover's paradise for the pages of my upcoming colouring book. An interview with Jenny Tang: Amelia’s Colourful Colouring Companion featured artist. A recent graphic arts graduate, Jenny Tang has created a fabulous image featuring a page full of hungry dogs - featured in my upcoming colouring book.